Aerial sunset view of the most exciting city in the world, the famous Las Vegas. 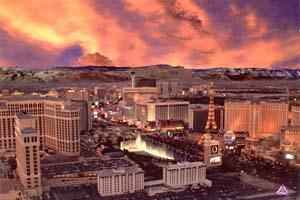 This gorgeous colorful postcard illustrates the casinos and the city at sunset. A real collectors item in the making. Postcard size is 6 inches by 9 inches. Minimum order is 10, Free USA shipping on all quantities of 10-10,000. Orders processed within 48-hours and shipped First Class mail. Retail price per postcard is $2.50.